The physical surface expression of the Chicxulub crater was revealed using vector and raster data analyzed in GIS. ArcGIS revealed conditions that set the basin zone apart from other parts of the peninsula. Surface analyses in the GIS revealed hot spots where the highest frequencies of features occur. Access to water for drinking and agriculture is widely regarded as a determinant of settlement for early civilizations. The ancient Mayas who occupied much of Mesoamerica, a region that extends from the Valley of Mexico into the Yucatán Peninsula, modern-day Guatemala, Belize, western Honduras, and beyond, were no exception. They located settlements near rivers, caves, and cenotes (natural water-filled sinkholes); modified the landscape by creating wells, chultunes(cisterns), and aguadas (culturally modified lakes); and ditched swamps for agriculture. Due to a scarcity of rivers or other surface water features and greater aridity, adaptive options were limited in the northwestern Yucatán as compared to other portions of Mesoamerica. The apparent absence of accessible water sources predicts a less dense settlement pattern than other parts of the region; however, the area contains significantly higher numbers of archaeological sites. The impact of the Chicxulub meteor in shallow gulf waters covering the modern-day northwestern coast of Yucatán, Mexico, approximately 64 million years ago and subsequent formation of a 180-kilometer-wide sedimentary basin appear to have contributed to the development of a highly desirable environment for living in a region where surface water is all but nonexistent. Today, a ring-shaped zone of water-filled sinkholes, dzonot in Mayan, marks the location of the crater rim. The ring of cenotes spans approximately 244 kilometers along an arc projecting roughly 82 kilometers inland at its southernmost apex. Auburn University at Montgomery, Alabama, has a university site license and offers instruction in Esri products for GIS certificate and degree programs. The power of ArcGIS and its spatial analytical tools provided the ideal means to model and investigate a variety of geospatial factors that might have contributed to the relic built environment, which remains on the arid northwestern Yucatan Peninsula at present. 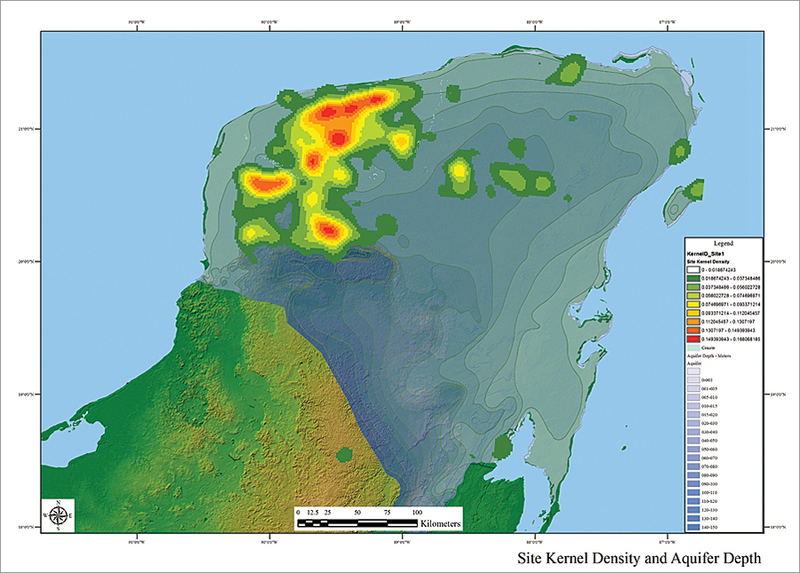 A variety of vector and raster data was collected, processed, and analyzed in ArcGIS to reveal the physical surface expression of Chicxulub characterized by a relatively flat zone bounded by concentric crescent-shaped shallow troughs and a ring of cenotes and a relic cultural landscape of ancient settlements situated within the basin area. Analytics created in ArcGIS revealed a statistically significant, geospatially patterned distribution of two water management strategies. Settlement locations plotted over a layer of aquifer depths interpolated from data collected in the field provide additional evidence that the Chicxulub basin area was a preferential location to establish settlements in ancient times. The ancient Mayas populated the Yucatán Peninsula by applying a range of adaptive strategies to cope with a scarcity of surface water. The idea that the Mayas purposely established settlements near sources of water and the significance of cenotes to settlement distribution are widely accepted. The modern Mayas continue to construct dwellings above the remains of ancient settlements. Field surveys on the Yucatán Peninsula during 1999 and 2001 revealed that for each visible cenote in or near the ring, many others are either too small to provide a return in remote sensors or concealed by dense vegetation. For example, the walled area at Mayapan, an ancient settlement located 4 kilometers north of the ring zone, covers approximately 5.5 square kilometers. More than 30 cenotes of varying sizes have been reported at Mayapan, while none are detectable as a water feature in satellite data. Cenotes or natural wells, like those found at Mayapan, are ubiquitous on the surface of parts of the peninsula inside the ring of cenotes. Today, the indigenous inhabitants often modify cenotes with small openings by constructing well curbs and installing winches to draw water from the vast network of underground water-filled chambers. Approximately 64 million years ago, a sizable meteor impacted in shallow gulf waters covering the modern-day northwestern coast of Yucatán, Mexico. 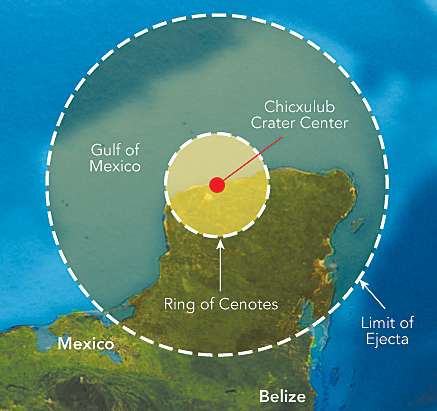 The resultant crater, called the Chicxulub crater, is a 180-kilometer-wide sedimentary basin, which appears to have contributed to the development of a highly desirable environment for living in a region where easily accessible surface water would otherwise be all but nonexistent. 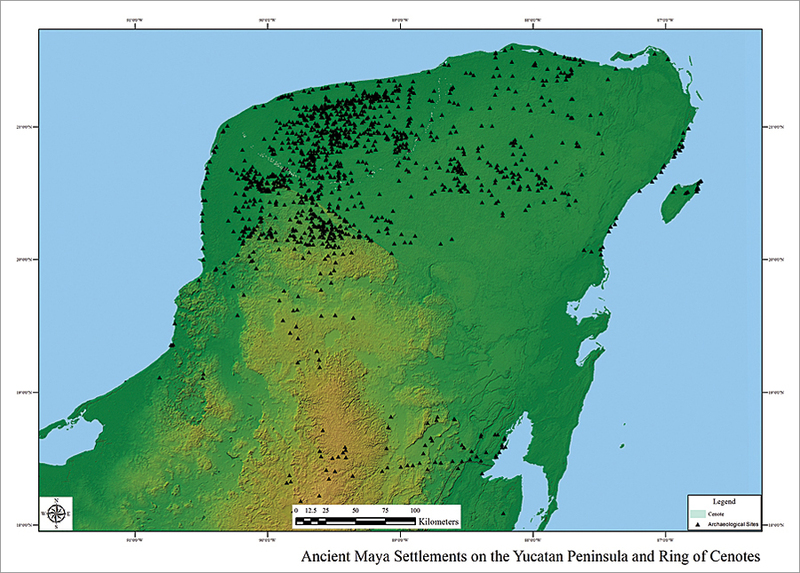 The dataset for this research contains the geographic locations for 1,694 known archaeological sites and 7,430 modern populated places located on the Yucatán Peninsula. A region of interest (ROI) was defined that contains 1,152 ancient settlements and 1,458 modern populated places distributed among 588, 39.7-square-kilometer quadrats in a graticule created to accomplish point pattern analyses. The region of study covering most of northwestern Yucatán, Mexico, has been intensively surveyed over the past 150 years. 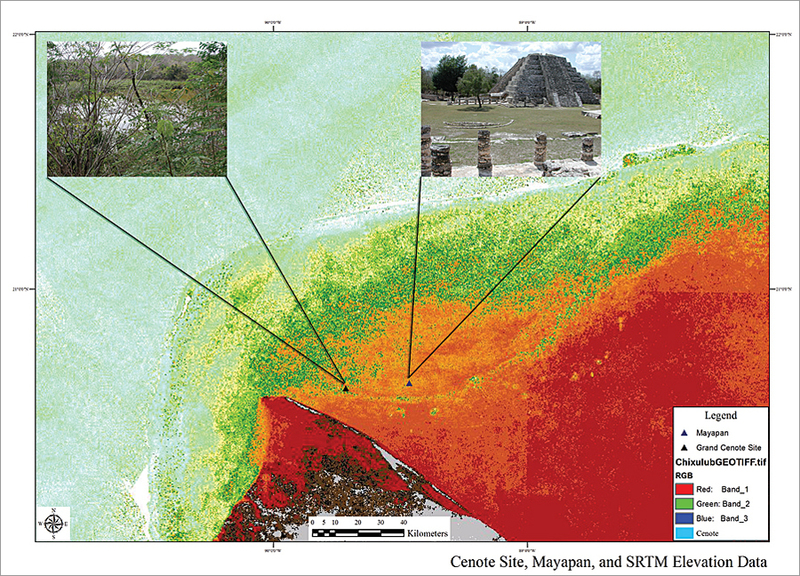 Using visual and computer-assisted classification techniques for remote-sensing data, 211 cenotes were identified along the trough that defines the ring of cenotes. While studies have shown that the Mayas consistently built their communities proximal to smallcenotes, spatial queries in ArcGIS indicate that a significant number of known archaeological sites in the database do not occur adjacent to or near the largecenotes that form the ring zone. In effect, the ring of cenotes bisects the northwestern peninsula into two subregions with proportionally different settlement densities, one inside the Chicxulub area and the other south of the ring in a hilly area known as the Puuc. Of the 211 cenotes identified in remote-sensing data within the narrow ring zone, 5 (2.4 percent) are within half a kilometer of documented sites. That number increases to 12 (5.7 percent) when the distance is increased to 1.0 kilometer. An undetermined (but, in all probability, small) number of cenotes known to exist today were almost certainly not fully developed 1,000 to 2,000 years ago. Additional potential causal factors are discussed below. Nevertheless, the findings suggest that large cenotes located in or near the trough marking the ring feature itself were not overly attractive sites for settlement, as opposed to small cenotes. A total of 754 settlements representing 65.45 percent of the known archaeological sites in the ROI are located within the 294, 39.7-square-kilometer quadrats falling inside the Chicxulub basin area. The remaining 398 (34.55 percent) are situated in the 294 quadrats outside the area. Variance-mean ratios (VMR) were calculated to determine if observed spatial patterns of locations in the ROI are statistically significant. The VMR of 3.359, corresponding t-statistic of 57.545, and p-value of less than 0.0001 for ancient settlements indicate a significant nonrandom pattern exists in the distribution. Based on a larger 56.1-square-kilometer quadrat size, the VMR for ancient sites is 4.425 with a t-statistic of 62.977 and p-value of less than 0.0001. The distribution favors the Chicxulub basin area and argues for the presence of an underlying benefit the ancient Mayas derived by establishing settlements there. To calculate VMR, formulas were written in a summary table containing the inventory of archaeological sites per quadrat in the ROI. A difference test was applied to establish the statistical significance of the VMR. The null hypothesis assumed randomness—thus, no difference between observed and expected frequencies by quadrat. For testing purposes, no major physical evidence was present to suggest the remains of ancient settlements should be clustered. Consequently, a nondirectional, two-tailed test using the chi-square of the VMR was selected. Nearest neighbor analysis conducted in ArcGIS for site locations in the ROI returned an observed mean distance of 0.0168 and an expected mean distance of 0.0210 with an R-statistic of -0.8014. The statistic indicates a low probability that the pattern is random. Maya sites in the study with cenotes marking the buried rim of the Chicxulub impact crater plotted over SRTM elevation data in ArcGIS. Further analyses in ArcGIS revealed no additional causal relationships between any single factor, such as rainfall, climate, or soil type, and ancient settlement location except access to water. The relatively higher site density inside the Chicxulub area suggests that access to water was less problematic in that location. A layer for aquifer depth zones was created in ArcGIS using well and cenote ground-to-water surface depths collected during fieldwork. The layer turned out to be a key piece of evidence to explain why settlements cluster inside the Chicxulub basin area. Shallow aquifer depths, normally found along the peninsular littoral, extend inland across a major portion of the Chicxulub basin area. The 10- to 15-meter zone skirts the northwestern section of the Ticul fault, then tracks inland along the crescent-shaped ring of cenotes, creating an anomalous inland area of locally shallow readings covering nearly 1,700 square kilometers. Widespread access to the shallow aquifer is a major environmental feature that distinguished northwest Yucatán from other physical zones in the Maya lowlands and attracted the Mayas to the area. Natural or artificially excavated ancient wells and chultunes occur in dissimilar patterns that correspond to variations in aquifer depths throughout the ROI. 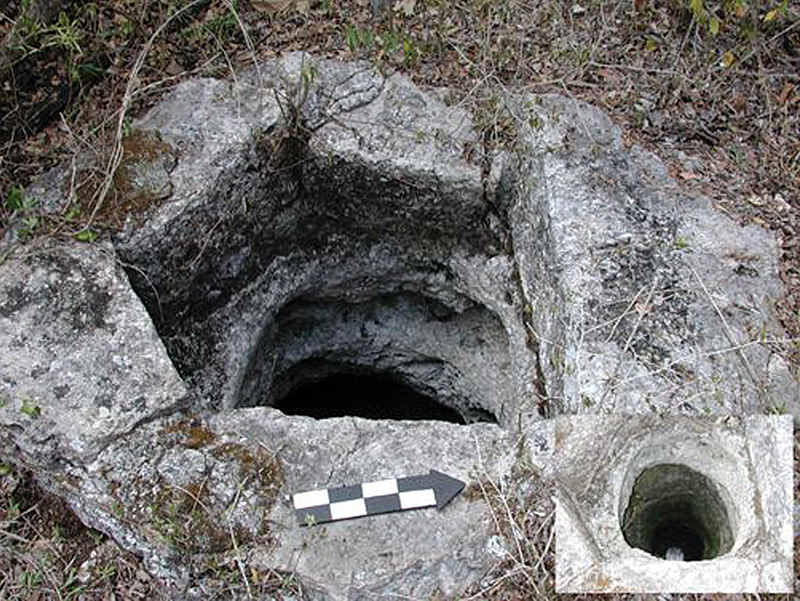 Higher frequencies of naturally occurring small cenotes and artificially constructed shallow wells are found at archaeological sites inside than outside the basin area. Surface analyses in ArcGIS reveal hot spots where the highest frequencies of both features occur. The number of shallow wells at archaeological sites inside the basin area totals 195 at 80 sites. Only two wells have been reported for locations outside the area but in the ROI. Ancient wells are occasionally found outside the ROI but typically are located at the bottom of dry sinkholes or depressions where the aquifer is a few meters below the surface. No chultunes were documented for basin area settlements, whereas 707 were found at 63 nonbasin area sites in the ROI. An abrupt falloff in the presence of wells takes place within the 15- to 20-meter aquifer depth zone. Chultunes begin to appear where depths range from 20 to 30 meters. The absence of wells in this section of the ROI and the apparent 20-meter threshold suggest that the Mayas were limited by their technology to a maximum depth at or near 20 meters. The Chicxulub basin area is a setting where, over time, karstic processes produced abundant small cenotes that intersected the shallow aquifer and served as natural wells. ArcGIS revealed two conditions that set the basin zone apart from other parts of the peninsula: high frequencies of natural wells or cenotes and shallow aquifer depths. The ancient Mayas were acutely aware of this unique environment and thus took advantage of cenotes or shallow wells as reliable and constant sources of water. Where static levels exceeded the Mayas’ technical capabilities, they employed a less desirable but effective alternative, excavating chultunes to capture and store rainwater for use during the dry season or transporting water drawn from sources accessible by foot, such as caves or open cenotes in the area. Portions of this research were supported by the National Science Foundation, the Louisiana State University Department of Geography and Anthropology, and INAH Mexico. Dr. Terance L. Winemiller is an associate professor of anthropology and geography; chair of the Department of Sociology; and director of the Geospatial Research Laboratory at Auburn University, Montgomery. He is involved in ongoing archaeological research in Mexico, Belize, Honduras, and Ecuador. Winemiller holds a PhD from Louisiana State University and has been using Esri products in his research program for 20 years. For more information, contact Dr. Terance L. Winemiller, associate professor of anthropology and geography, Auburn University, Montgomery, Alabama.